THE NAKED CITY – RAILROADED! Posted January 23, 2019 by Coffin Ed & filed under City News. Successive NSW governments have a questionable record when it comes to wrecking and destroying things like 30-year-old football stadiums, architecturally significant convention centres, iconic Australian museums and a whole range of historic buildings in concert with rapacious developers. And when demolition does take place it’s often done with an almost indecent haste, as is the case with Allianz Stadium. Whilst total destruction of the stadium has temporarily stalled we do know that many of the seats were palmed off on unsuspecting country footy clubs, despite the fact that they were regarded as flammable. With only three decades of history behind them, it’s unlikely they would ever appeal to collectors unlike similar sporting memorabilia dating back 50 to 100 years. For example, an original wooden seat from the old Yankee Stadium in New York can command over $1,000 (US) on eBay. Nevertheless, you have to think that the stadium does contain some items of historical interest that hopefully will be preserved before the wreckers’ balls start to swing. The old dressing rooms surely must have some stories to tell and what Rugby League fanatic would not want a piece of the wall, complete with a fist hole punched through by an irate front rower. The sweat-stained carpet, complete with the DNA of some of Australia’s sporting greats could surely be cut into 6cm squares and flogged off to fans around the country. Which leads us to the recent shocking news footage of the State’s so-called ‘Silver Rattler’ carriages being mercilessly trashed, ripped apart like an orange at an anonymous scrap metal facility. Whilst a few of the carriages have been mothballed in case of emergency and one or two preserved as museum pieces, most of the old workhorses have been savagely junked – much to the despair of railway buffs around the country. Unlike the previous dispersal of superseded railway carriages, where a number were offered for public sale, the Silver Rattlers have gone straight to the crushers. Many railway tragics have since come forward and stated they would have loved to have given one of the old double-decker carriages a permanent resting place on their country property. Like the old Red Rattlers, the carriages are more than suitable to be repurposed as either quirky accommodation, a hen shed or even an enormous stretch man cave. Whilst the Red Rattler trains were once the laughing stock of Sydney with their stifling hot carriages and clammy green vinyl seats, a half-century later and we love them – especially when they house a BNB in West Wyalong or an outback bar in Whoop Whoop. Put a few of the preserved carriages back on the rails for a day and nostalgic Sydneysiders go crazy, flocking in their sentimental numbers to wallow in un-airconditioned discomfort. Unfortunately, most of the damage has been done and the next time you see a Silver Rattler it’s likely to be in a museum – although not the Powerhouse at Parramatta where they would barely have enough room to house one. What an opportunity the State Government has missed! 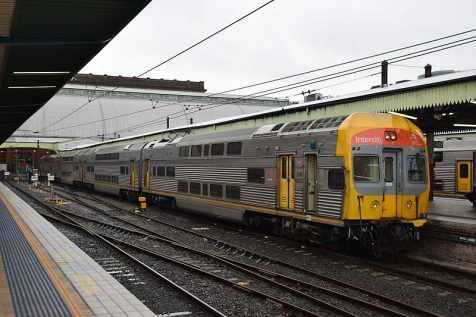 For starters, the homeless are already sleeping on the intercity versions of the Silver Rattlers so a couple of refurbished carriages would have made a great temporary hostel in somewhere like Woolloomooloo – not an ideal situation but better than sleeping on the street as many still do. And finally, an even more extreme suggestion would have been to donate at least a dozen or more of the carriages to George Miller for the next Mad Max movie. The site of a flotilla of deconstructed Rattlers tearing across the desert outside of Broken Hill would almost guarantee the success of another epic in the franchise.